Sathya Sai Baba - "I see what you don't"
This incident relates to the trip made by 52 blind children to Swami several years back. I had always wanted to narrate the same to Sai devotees, my sole intention being to propagate the message that Swami often sees what we don't. A Sathya Sai Center functioning in Chennai, a metro city in Southern India was fortunate to be blessed by Swami's visit, 5 times, each of these when He visited Chennai. A practice (that continues till date) in the center is Reading for the Blind on at least 2 Saturdays of the month. Swami inspired one of the devotees to bring these 52 students to His Divine Presence. What follows here is amazing. There was no prior intimation to Swami in any way that these students were being brought from Chennai all the way to Parthi. On the way, the devotees entrusted with the task of taking these blessed students to Swami encountered many a hardship. Wonder of Wonders, when they reached Parthi, they were given a special block at the Darshan Hall and Swami spent several minutes with the group. At the end, He signaled one of His Students to bring something from the Interview Room. Sairam brothers and sisters, only our Beloved Lord knows and cares for every being in this world. The Student then brought out 52 Braille watches, each of which was personally presented to the students by Swami. 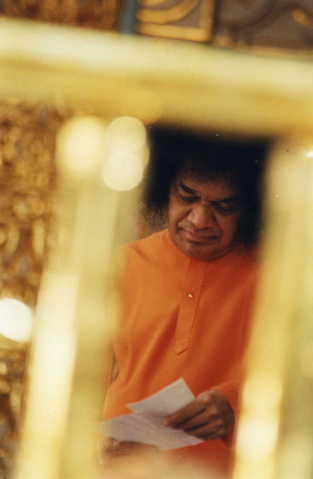 Swami also demonstrated the use of the same. How these watches appeared in the Interview Room is a miracle, that only Our Lord knows. This especially because, there was not even the slightest hint made to Swami about the arrival of these students. Yet another Mahima of Our Dearest Lord!! !